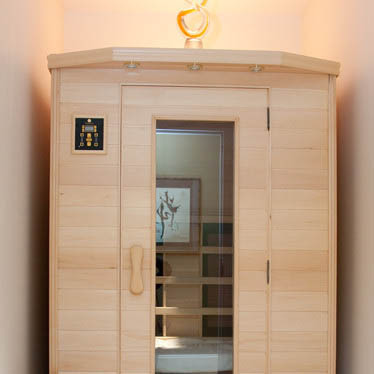 Our Day Spa at Groton Wellness Center offers a detoxifying Far Infrared Sauna. Far Infrared heat spreads its warming influence within deep tissue layers, releasing toxins through sweat and improving circulation. This is critical, for so many present-day ailments that are associated with the storage of toxins in the body. Many kinds of chronic pain respond well to Far Infrared heating: arthritis, neuropathy, and various kinds of joint and back discomfort often decrease when exposed to Far Infrared heat. 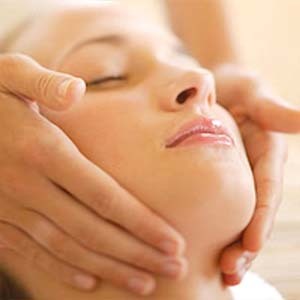 Many of the toxins that the body cannot expel, for example, lead, mercury, and certain complex chemicals, store in fat tissues deep below the skin. Far Infrared heat reaches into these deeper layers, making it possible to pass these stockpiled materials out through the pores. Our Far Infrared Sauna uses invisible light waves that transmit heat that deeply penetrate body tissue. This enhances removal of toxins through the stimulation of the cardiovascular and lymphatic systems. The emitters used by this sauna are so gentle that hospitals use this technology to warm premature babies. A 30-minute session in our Far Infrared Sauna can burn 300-600 calories and is extremely effective in relaxing joint and muscle tension, providing you with a most beneficial treatment before a Massage. Far infrared light is used to heat the body rather than steam heat or dry heat from electricity or fuels. Far Infrared Saunas heat the tissue of the body three times greater than traditional saunas and many times more deeply. Unlike a traditional sauna where the hot air temperature can make it difficult to breathe and to stay in for long periods of time, the air temperature of the Far Infrared Sauna is between 100 – 140 degrees Fahrenheit, making it more comfortable for most individuals. Typical treatment times are between 20 and 45 minutes. NOTE: If you are under medical care for any medical condition, consult with our medical team prior to using the Far Infrared Sauna. Call 978.449.9919 to schedule your appointment. Please ask about our series pricing for Far Infrared sessions.